How to take care of an Individual with Parkinson’s Disease? Parkinson’s Disease or PD is a long-term progressive neurological disease that affects the nerve cells in the brain that produce dopamine by destroying the part of the brain known as basal ganglia. In simpler words, it is a disorder of the central nervous system that affects the motor system of the brain. Generally, after diagnosis of Parkinson’s disease, care of patient is very important and treatments are carried out to prevent the symptoms from worsening. However, there is no cure for PD. This also depends on the age factor of the patient. Therefore, taking care of a Parkinson’s patient is very important. The most obvious and early symptoms of Parkinson’s disease are misbalancing, shakiness, rigidity of the body and slowness of the movement as well as difficulty in walking. Psychological problems like thinking and behavioral problems may follow too, whereas dementia may occur in the advanced stages of PD. Other symptoms include depression, anxiety, sensory, sleep, and emotional problems as well. Taking care of a person with Parkinson’s disease in home care is a tough job. This is because PD is itself never easy on the person who is going through it. The caregiver should be well experienced to handle such patients because when PD progresses, it becomes very complex for the home nursing staff to look after such patients as he or she needs more emotional support to fight with PD. A caregiver should understand that offering more love and support to the Parkinson’s patient will spark hope for the patient to fight against PD. This will keep patients a little calm and they tend to stress lesser, which leads to positive vibes in a person with PD. 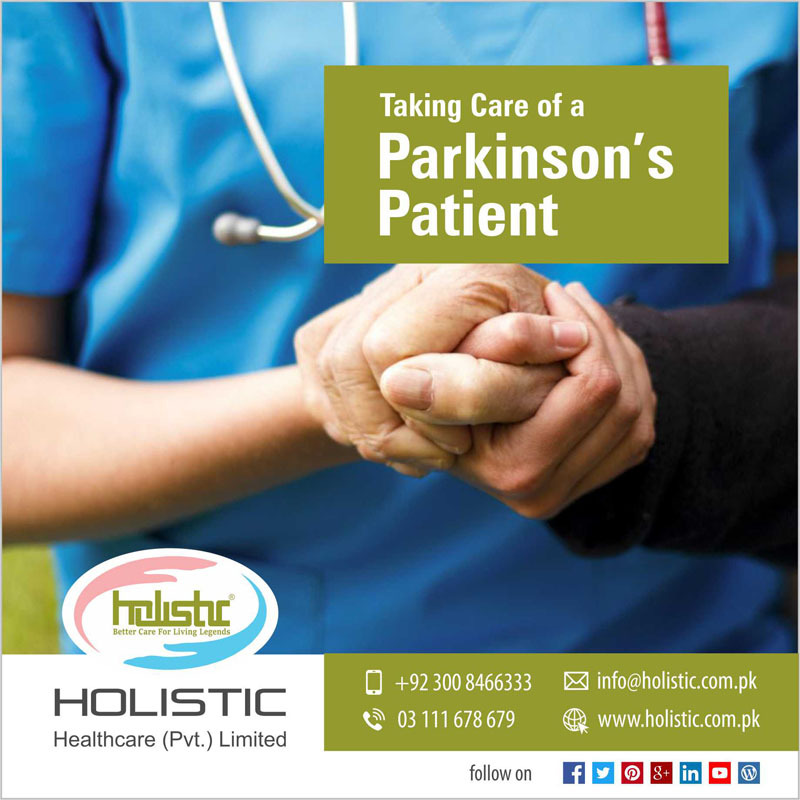 It is very important for the caregiver to understand that home health care services for a Parkinson’s patient include the quality of his life which can eventually prevent worsening of the symptoms of the disease. The caregiver should also make sure that a patient with PD avoids smoking or for better quit smoking altogether, and never drink caffeinated beverages. The dietary habits are associated with small increases in the risk of developing PD but risks are uncertain sometimes. Likewise, in-home help, if a caregiver insists on the leisure and physical activities such as walking, swimming, dance, yoga, and some walk, it can also play an important role for the individual suffering from Parkinson’s disease. A caregiver should work closely with the other doctors of a Parkinson’s patient so that he or she may seek advice from a movement disorders specialist, psychologist, or psychiatrist if needed. He should keep the doctors updated on how the PD patient is doing regarding the daily routine of medication and physical activities assigned by the physicians. Another important aspect of health care services for those with Parkinson’s disease is to pay close attention to their medication routine and the factors that take time to help their symptoms as well. The caregiver should also be attentive enough to look into the progression of the medication and whether more dosing is required as the disease progresses. If a loved one suffers from Parkinson’s, especially advanced stage Parkinson’s, they may develop further complications with time. Without proper care, attention, and exercise, the disease advances, causing mobility issues. Getting help from a professional caregiver is advised in such cases. If you need caregiver services at the comfort of your home, contact Holistic Healthcare (Pvt.) Limited. We have professional and trained staff that can take care of your loved one for you at the comfort of their home. Call us at 0300 8466333 to discuss the current state of your patient and how we can be of assistance.